A region as vast and majestic as Auckland can only truly be appreciated from the air. Auckland Seaplanes will take you on the flight of your life to discover the beauty of the Hauraki Gulf from a breath-taking perspective aboard their unique seaplane. After a one-of-a-kind experience of taking off in the heart of the Auckland Harbour, enjoy serene views of the Rangitoto crater, Auckland's youngest volcano and Motutapu Island. Soar over the kiwi-favourite destination, Waiheke Island, with its luxurious properties, golden beaches and stunning vineyards, and soak in the picturesque scenes of the many surrounding islands before experiencing an exhilarating landing in the Harbour of the City of Sails. Our knowledgeable pilots have many years of experience in pleasure flights in this beautiful region and will show you the very best of what's on offer in a safe and entertaining way. They can also speak German, Japanese, Spanish and French helping international visitors make the most out of their flight experience. It was an awesome experience! Loved it and recommended to all my friends. Hi Michelle, Thank you for your review. It was absolutely great to have you on board and we are very pleased that you enjoyed seeing the local sites from above. 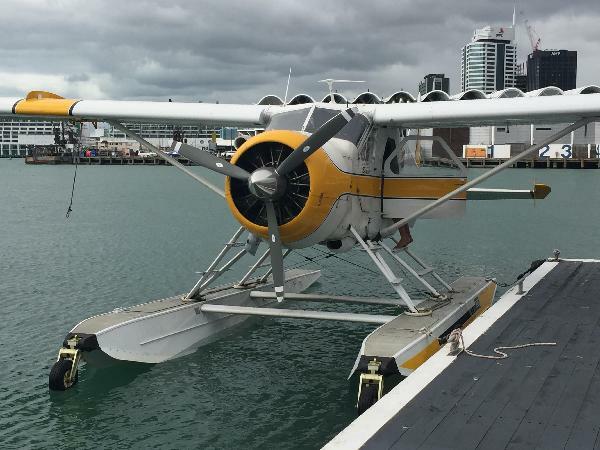 Best wishes Auckland Seaplanes Team. superb trip. Pilot was friendly. Would love to do it again. For something a little different, this sea flight was heaps of fun. Staff and pilot were helpful & friendly and the views over the city and the islands were fantastic. Would definitely recommend this to others. A must do when in auckland. Amazing views. Your message has been sent to Auckland Seaplanes Scenic Flight. You should hear from them shortly. Please note: all responses will come directly from Auckland Seaplanes Scenic Flight, and not the team at Bookme.